The Company of Fellowship may be awarded by The Crown once per reign to a recognized branch within the East Kingdom, below the kingdom or principality level, which displays an exceptional level of unity while promoting the ideals of the Kingdom and the Society. The Company of Fellowship is not to be presented at the event for which it is being awarded, except at the Pennsic War, during which the Company of Fellowship may be presented in East Kingdom Court for an exceptional event earlier in the war. As the Company of Fellowship is awarded for a specific event, a group may receive it any number of times for any number of different events. The Company of Fellowship was established July 9 A.S. 51, 2016, by Kenric III and Avelina III. The group receives a pennon bearing the badge of the Company of Fellowship and the initials of the bestowing monarchs to display alongside in conjunction with their branch arms. 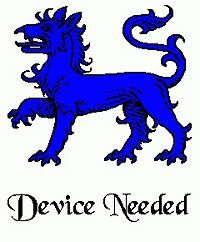 (The originally proposed badge could not be registered through the College of Arms and will be redesigned.) The initials of the bestowing King and Queen are added to the banner. This page was last edited on 25 February 2019, at 11:33.